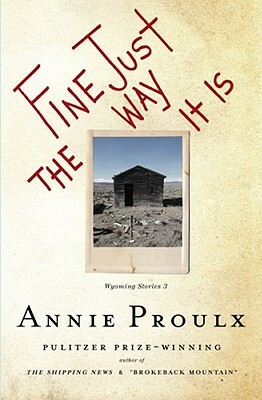 Returning to the territory of "Brokeback Mountain" (in her first volume of Wyoming Stories) and Bad Dirt (her second), National Book Award and Pulitzer Prize winner Annie Proulx delivers a stunning and visceral new collection. In Fine Just the Way It Is, she has expanded the limits of the form. Her stories about multiple generations of Americans struggling through life in the West are a ferocious, dazzling panorama of American folly and fate. "Every ranch...had lost a boy," thinks Dakotah Hicks as she drives through "the hammered red landscape" of Wyoming, "boys smiling, sure in their risks, healthy, tipped out of the current of life by liquor and acceleration, rodeo smashups, bad horses, deep irrigation ditches, high trestles, tractor rollovers and 'unloaded' guns. Her boy, too...The trip along this road was a roll call of grief." Proulx's characters try to climb out of poverty and desperation but get cut down as if the land itself wanted their blood. Deeply sympathetic to the men and women fighting to survive in this harsh place, Proulx turns their lives into fiction with the power of myth -- and leaves the reader in awe. The winner of two O. Henry Prizes, Annie Proulx has been anthologized in nearly every major collection of great American stories. Her bold, inimitable language, her exhilarating eye for detail and her dark sense of humor make this a profoundly compelling collection.